I have another TOS Crew review for you today! 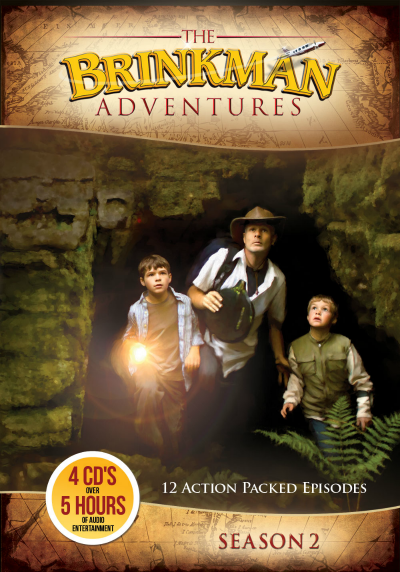 I was given the opportunity to review a series of audio episodes from The Brinkman Adventures. The Brinkman Adventures is about a missionary family and all the adventures they go on as they spread God’s word. There are 2 seasons so far, each with 12 episodes. Our family was given a download of The Brinkman Adventures Season 2: Episodes 13-24 to listen to and then review for all of you! We were given the download, but if you prefer the physical CD, that is also available. Either way, it is over 5 hours of entertainment! I have to tell you, I enjoyed these stories a lot! Anyway, his family would gather around the radio and listen. Nothing to look at… you had to picture the story in your head, much like reading. All that to say, my son was not a huge fan of the Brinkman Adventures. They did grow on him a bit as we got into them. I think he wanted to see what adventure they would go on next. He would never quite admit that to me, though. I definitely had to make him listen to the first couple of episodes. My daughter (12) enjoyed the episodes from the beginning. She has always been more apt to enjoying CD stories and she loves reading, so I think that helped. Please don’t let my son’s opinion dis-way you. My daughter definitely enjoyed them and so did I!! The stories are based on real events that the Brinkman’s experienced while being missionaries. It was really neat to hear about all the ways that God helped them along the way. And to listen to how much trust they had to have in God in order for things to work out the way they did. I love that my kids are hearing that. It will hopefully help them to learn to trust God in their own lives and learn to turn to Him in their times of struggle. Of course, we are teaching them that already, but to hear it working in other people’s lives will help to concrete it. I don’t want to spoil any of the stories for you by telling them to you, but just know they are wonderful. The voices in the stories are the actual Brinkman family voices. It’s so cute to hear their youngest “acting” out her part! She does a great job! And I love that they use actual experiences. Some of them are dramatized a bit for story’s sake, but still true. Also on their website, they have the true backstories for each episode. So after we listened to each episode, we would go online and read about the backstory, which also include some videos too. All in all, we really liked the series. The only disappointment is that we got Season 2. Now we have to get Season 1, so we can catch up on the beginnings of their adventures! What is it? Season 2 of The Brinkman Adventures – a CD or download of 12 audio episodes. For Whom? The whole family! I even enjoyed them and at times they brought me to tears listening to how God worked in their lives. Click below for more TOS Crew reviews!